Two legendary masters appealing to our deepest feelings : Bach with an intellectual approach, Weiss as a real romantic in the baroque. "Johann Sebastian Bach and Silvius Leopold Weiss were both German and almost exact contemporaries. They knew and appreciated each other. As performers they were without equal. From the beginning of the 20th century guitarists such as Miguel Llobet and Andres Segovia have arranged baroque and classical works for their own instrument. Playing the 8-string guitar, the old lute repertoire can be played without having to make drastic changes to the original music. For Bach's violin sonatas things are a little more complicated. These are difficult polyphonic works, written for an instrument that is basically not polyphonic. 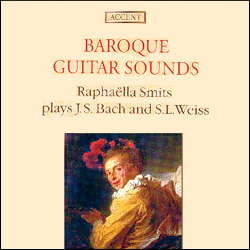 The music can be played straight from Bach's wonderful manuscript, with the addition of the necessary harmonies - as Bach himself used to do, and as Raphaella Smits does on this recording." Comme il est plaisant d'écouter une Ciaconna vraiment phrasée comme une chaconne, légèrement inégale, ornementée avec à-propos." "Having selected some of the finest transcribable material the baroque period has to offer, Smits gives a performance in which, quite simply, she does everything right. A programme of pure excellence!" "Raphaella is at her best in the Tombeau's of Weiss. Timidly she pulls the melancholy from underneath the string, in a game of clair-obscure in which even the light high register has something melancholic, and the deep darkness is not without some rebellion. She plays Bach with as much care for the perfect sound, but rather starting from a more structural understanding. The languorous gait of a Sarabande, the more pointed plucked Bourrée, the subtle differentiated episodes of the Fuga, it has all become pure guitaristic language." "As an organ player and pianist, so familiar with J.S. Bach, I can hear him today from under your skillful fingers in a sublime interpretation. Impressive!" "Die Gitarrenadaptation von Bachs Ciaconna ist einer neuen Erfahrung. Absolut stilsicher interpretiert klang das Werk auf angenehme Weise ungitarristisch, so als würde es jemand auf einem leisen Tasteninstrument vortragen."